outside the United States, please dial 1-239-277-1667. Internet - Use the secure order form on our website to place an order safely online. Fax - Fax us at 1-239-277-0996 to place an order by facsimile. 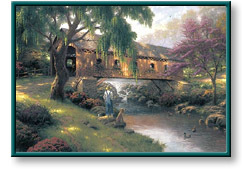 The Old Fishin' Hole copyright © 2003 by Thomas Kinkade is prohibited from being copied. All applicable copyright © laws apply and are reserved by the artist Thomas Kinkade. Web pages copyright © 1998-2003 by Christ-Centered Mall, Inc. All Rights Reserved.